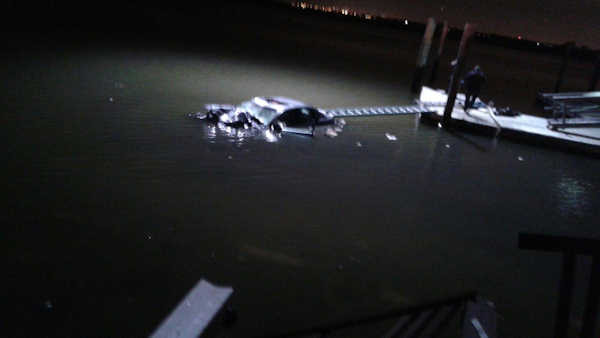 ISLAND PARK, Long Island (WABC) -- Police on Long Island rescued two people after their car went off the road and into the Broad Channel in Island Park Saturday night. According to Nassau County detectives, a 24-year-old man was driving a 2002 Audi sedan on Warwick Blvd./Block Lane when he struck a utility pole at about 9:55 p.m., causing wires to fall into the roadway. The vehicle then left the road, struck shrubbery, drove through a fence in between two homes and continued into the waterway in the rear of the houses, according to investigators. Fourth Precinct officers entered a rear home on Block Lane and saw the car approximately 50 feet from the bulkhead in 6 feet deep water. There were two people inside the vehicle, police said. The driver managed to crawl out and was on top of the vehicle, with a male passenger trapped inside. Police Officer Ahmad Kessba and Anthony Albanese quickly commandeered a 20 foot ladder and laid it onto the vehicles' trunk and floating dock. Officer Kessba carefully crawled over the ladder to the submerging automobile, while Officers Albanese, Paul Maywald and Jamal Ramos held onto the ladder. Police say Officer Kessba was able to reach the driver, pull him onto the ladder and then to land. Officer Kessba and an Island Park firemen, now on top of the sinking vehicle, held the passenger's head above water so he would not drown. After about five minutes in the water, an Island Park firemen dressed in a wet suit and a line swam out to the man, helped successfully remove him and swam back to the dock. Nassau County Police Aviation transported the passenger, who sustained multiple fractures to the leg in addition to a shoulder injury, to a local hospital. Island Park Fire Department transported the driver, who sustained abrasions, to a local hospital for evaluation. Detectives report no apparent criminality.